"I am inspired by trees in the western United States that seem to defy gravity and reason and grow out of bare rock, their root tips seeking nourishment from an unseen source. Against all odds these trees manage to persevere and even thrive in harsh elements. Though twisted and misformed, they are beautiful creations. I've always admired subtle comparisons between humans and trees and our existence together on this earth. This quilt is dedicated to people who struggle with life's burdens in their daily lives but somehow manage to hang on by sheer will and even flourish. The sky was made by layering multiple colors of polyester sheer organzas. 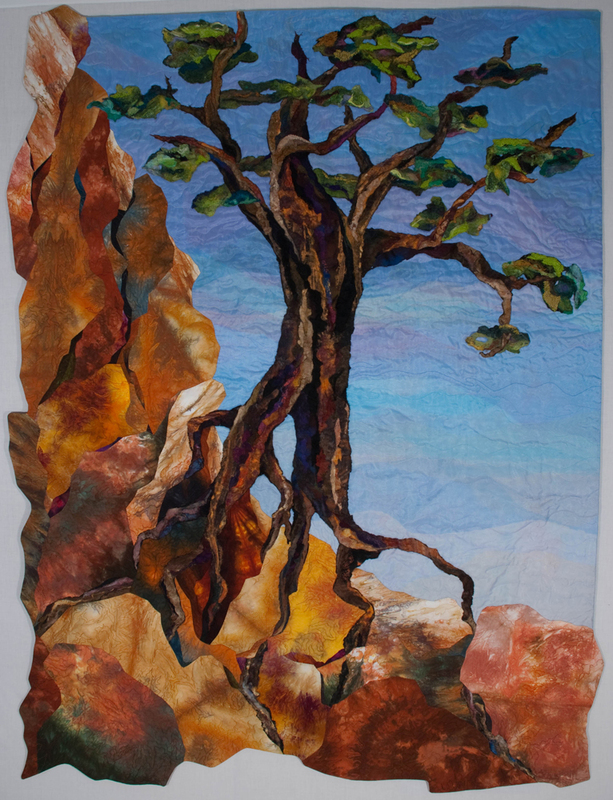 Trees and leaves were constructed using felting techniques to mesh cotton fabrics, silks, wool and silk roving, polyester sheer organzas, cheesecloth and threads. My topstitch technique, using cotton fabrics for the rocks, completed Against All Odds."